Aurora News: Intaki system sees development of new genetically engineered livestock! Intaki system sees development of new genetically engineered livestock! Genetically engineered livestock is the result of the agricultural sector's demand for suitable livestock for various circumstances. This can vary from a cow that produces extra milk to a hybrid creature that can survive and even produce suitable food in harsh circumstances. Due to this, it's an industry that's always in motion, at the forefront of colonisation, to develop suitable livestock for worlds that are unable to support the classic, unaltered livestock for a variety of reasons. In this case, the Trimeryevaaryam pastures, owned by Richard Masseri, saw the unveiling of specifically tailored livestock. They were genetically enhanced for rapid growth, to supply milk & meat at an accelerated rate. Even their age has been genetically tailored so that they would pass away on the moment of their prime, providing prime meat without the need of the animal to suffer the stress of being slaughtered. To celebrate the successful deployment of this new genetic livestock breed, capsuleer Masseri organized a celebration at his planetside mansion on Intaki V. People interested to attend were invited to come along and have a good time! Having a party and a presentation! Arriving early at the Masseri mansion allowed me to marvel at the beautiful Grand hall, where the party would be held. Being an excellent host, Capsuleer Masseri provided a wide selection of food, from fruit, to meat and anything in between. His staff was also present, carrying around refreshments and taking orders to accommodate the guests. Shortly after the official start of the event, Mr Masseri held a short but good speech, reminding folks that the invitation they received also doubled as ticket for a ship-raffle later in the evening! Giving the attendees the possibility to win a Police Comet, or even a chance for the brand new Garmur frigate, all fitted for next week's Federation day! As the evening passed, more guests arrived, giving way to a variety of talks & discussions! The discussions handled a variety of topics, ranging from discussions about the various media outlets to chatter about the different ways of trading, with enjoyable talks about cybernetic enhancements thrown in. Then an announcement was made, a presentation would be held by a scientist from the genetic lab, explaining the enhanced qualities and altered characteristics of this newly developed breed. This genetically engineered livestock has been created with immunity to most common diseases, enhanced meat & milk production. As everything comes with a trade-off, this particular breed had a short lifespan, but in this case it had been tailored to the point of the livestock dying on his prime, so it would never need to suffer the agonies of old age and also serve as an indication when the meat was ready to be processed without the animal suffering stress from the process of slaughter. Afterwards, a tour was offered to visit the Trimeryevaaryam pastures and observe this genetically enhanced livestock in their natural environment. This proposal was gladly accepted by almost all attendees! As people enjoyed the outdoors tour, it also served as an excellent opportunity to have your questions and concerns addressed about this enhanced livestock breed. Once the crowd returned to the mansion, it was time for the ship raffle! Everyone had received a unique number on their invitation, and the winners would be selected through a drawing by an innocent hand. To eliminate any form of doubt, Masseri showcased the winning numbers on a screen. Initially there were some technical difficulties concerning the lottery display, but they were resolved quickly by the technical staff. First price up was the Police Comet. As a staff member slowly pulled a number out the bag, people watched in anticipation on who would win it! And the winning number was owned by James Syagrius! His occupation as a free trader did spur quite some jokes about him winning the Police comet. Then the main price went up, a party-fitted Garmur frigate! People waited in anticipation as a new number was drawn from the bag. And as the winning number was displayed, belonging to Sanadras Riahn, a big applause broke out to celebrate the winner! And with this the event was over, or so we thought. Capsuleer Masseri did had one last surprise for all of us! A firework display celebrating the event's success as people undocked! Richard Masseri and Sanadras Riahn providing an excellent firework display! As this show endured, marvelling the leaving guests, Sanadras Riahn decided to test his party-fit Garmur he just won! And with this, the firework display went up a notch, turning it into a vibrant spectacle of color, with the planet Intaki V as a beautiful backdrop. 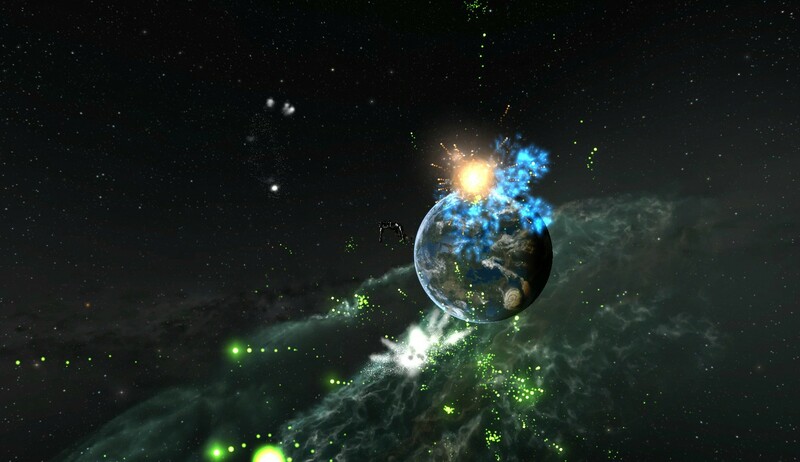 It also speaks to the professionality of Mordu's Legion that they kept the peace, allowing this firework display to continue unabated for a long time without hostile capsuleer intervention, despite that it lies in lowsec space. A very enjoyable event, with a nice variety of talks and a good way to meet several new & friendly people. Despite that it was held in lowsec, many attendees did take the extra effort to be there in person instead of using a holographic presentation. The celebration itself was very warm and friendly, open minded to newcomers, making them feel part of the event. All in all, I had a good time, and undoubedtly the others as well!